We’d love your help. Let us know what’s wrong with this preview of William Shakespeare's A Midsummer Night's Dream by Nel Yomtov. To ask other readers questions about William Shakespeare's A Midsummer Night's Dream, please sign up. Lovely art. Nice story, though I didn't find it that funny. Maybe reading the original will be more funny. Definitely will read the original. I absolutely picked this graphic novel up on a whim while shelving books one day. I'm a huge fan of A Midsummer Night's Dream (it's probably my favorite Shakespeare play) so I thought it'd be fun to read it in comic format. This book was shelved for middle grade readers but based on the illustrations and reading level of the text, I'd place it more in young adult. It keeps to the original tale fairly well in terms of plot points but I think it lacked the same humor the play has, and the reason I I absolutely picked this graphic novel up on a whim while shelving books one day. I'm a huge fan of A Midsummer Night's Dream (it's probably my favorite Shakespeare play) so I thought it'd be fun to read it in comic format. This book was shelved for middle grade readers but based on the illustrations and reading level of the text, I'd place it more in young adult. It keeps to the original tale fairly well in terms of plot points but I think it lacked the same humor the play has, and the reason I enjoy it so much. There are a handful of lines from the play included in this re-telling though not enough for my tastes. If you wanted to get an idea of what happens in A Midsummer Night's Dream, this would be a good resource. The images are vivid though not as fitting for the nature of the play, for me at least, but they would be good for students who want to gain a basic understanding of the major points. But I wouldn't go to this graphic novel for a representation of Shakespeare's work in terms of "accuracy" (well, as accurate as a comic re-telling of a play can be). I feel that this book wasn't very good. While I did enjoy that the book wasn't really written in old English, I feel the presentation was sloppy. The parts were all too short and the information told was mediocre. Not a fan of this book. A wonderful introduction to Shakespeare's classic play. This graphic novel is beautifully drawn and well written; it is easy to read and faithful to the original. This would be a great way to introduce young readers to Shakespeare. It's inspired me to read the original! Loved the Shakespearean quotes at the beginning of each act ... "If we shadows have offended, think but this and all is mended, that you have but slumber'd here while these visions did appear." ~W.S. I love the pictures, but I feel too much of the original story has been cut out that it is almost more confusing than if more of the story was left in it. Unfortunately, I don't think I can read this with my students like I planned. A good, faithful interpretation that would serve as a good introduction, but far too abridged. nice graphics, but it seemed super edited. fun to read nevertheless. maybe they could have added more of the favorite lines. This was a beautiful interpretation of A Midsummer Night's Dream. However, I would have liked it to go a bit more in depth; maybe a bit longer even. This was one of the plays that I think I read in High School but I can’t remember it at all. I’m pretty sure I didn’t actually read it anyway. I never read what they told me to. So having a graphic novel edition was a nice way to ease into it. I believe I enjoyed this a lot more than if I would have just read the play itself. This is obviously a graphic novel edition of Shakespeare’s famous play. This is pretty much a play about 4 young adults. A girl named Hermia is set to marry a man named Deme This was one of the plays that I think I read in High School but I can’t remember it at all. I’m pretty sure I didn’t actually read it anyway. I never read what they told me to. So having a graphic novel edition was a nice way to ease into it. I believe I enjoyed this a lot more than if I would have just read the play itself. This is obviously a graphic novel edition of Shakespeare’s famous play. This is pretty much a play about 4 young adults. A girl named Hermia is set to marry a man named Demetrius but is in love with another man named Lysander. Another lady named Helena is in love with Demetrius but he hates her. With a bit of accidental magic the young men’s feeling for each of the girl’s changes and leads to a rather large fiasco! Also, a man named Bottom ends up with a donkey’s head. I love the original, full-length live version of A Midsummer Night's Dream, and since I'm currently impaired and reading a lot of graphic novels, I figured why not? Is this useful for someone who's trying to get the hang of the play, perhaps for school? Overall, this version does a decent job of laying out the most basic premises: two couples, love gone awry, magic/fairies, the spat between Oberon and Titania, the play within a play and how/why Bottom turns into a donkey... I appreciated the ful I love the original, full-length live version of A Midsummer Night's Dream, and since I'm currently impaired and reading a lot of graphic novels, I figured why not? Is this useful for someone who's trying to get the hang of the play, perhaps for school? I just LOVED this. My friend and I both bought copies when we found it in our favorite bookstore. At the time, we were in a production of AMND, and we were like, "We MUST buy this!" It's a great summary of the play, with lovely graphics. (One thing I found interesting was that the drawings of Hermia and Helena looked a bit like a different girl and I, and we were playing those characters. Also, Demetrius and Lysander looked and awful lot like the boys who played them. And the drawing of Bottom (a I just LOVED this. My friend and I both bought copies when we found it in our favorite bookstore. At the time, we were in a production of AMND, and we were like, "We MUST buy this!" I have never read an y Shakespeare so this was my first. At first I didn't think I'd finish because I've extremely picky and hardheaded when I don't like the message of a story but I finished it and it was okay. I liked and and disliked it. I'd like to read more of Shakespeare and I think that's all that matters really. I thought this was a good retelling of A Midsummer's Night Dream. I liked how they used original language when they could but simplified the old English and shortened it to make it more readable. Of course the graphic novel format makes it more accessible as well. I enjoyed the pictures and thought it was drawn well. Adolescent # 8 - A retelling of Shakespeare's "A Midsummer Night's Dream" told in graphic novel form. The illustrations remind me of Japanese anime. This would be an awesome way to introduce Shakespeare to a class. I would definitely read this with a class before reading the actual Shakespeare work. It gives an idea of the plot and is helpful in keeping all the characters straight. A fun -- and clear -- graphic retelling of Shakespeare's "A Midsummer Night's Dream." The art is beautiful. The prose is clear and simple; not as beautiful as Shakespeare, but a lot more suitable for a young adult to understand. 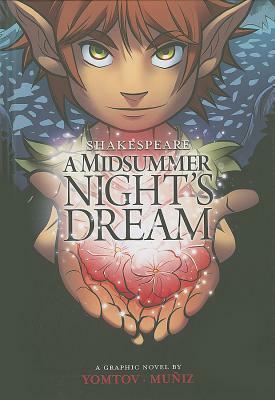 I've always been a fan of A Midsummer Night's Dream so this graphic novel just added to my love of it. The artwork is stunning. They should at this to school curriculum for middle school and even high school. It makes fun and easier to read. Simplified re-telling of the play in an approachable graphic novel format for children. Liked that it had a couple of informative pages at the back: history of the play; about Shakespeare; explanation of popular quotes from the play. While not a bad water down version of a Shakespeare classic (and my favorite), I felt they could have done better with the little iambic pentameter by putting a little more in. I did like the illustrations they showed good emotion and the background information at the end. A good precursor to our "A Midsummer Night's Dream" unit. Nice drawings, but it only shows the plot, not all the details and other things that make the story great.